The number of motor insurance claims involving uninsured or untraced drivers jumped by 17% between January and July, according to new figures. The data show there were 1,644 claims involving such drivers during the first seven months of 2016, up by 235 versus the 1,409 claims lodged during the same period a year earlier. The Motor Insurers’ Bureau of Ireland (MIBI) figures show 42% of such claims were made in Dublin with the capital also showing a big spike in general claims made compared to last year. Overall, there were 688 claims recorded in Dublin, up 78 on the 610 claims seen during the first seven months of 2015. The next highest number of claims were in Cork (129) and Galway (92). 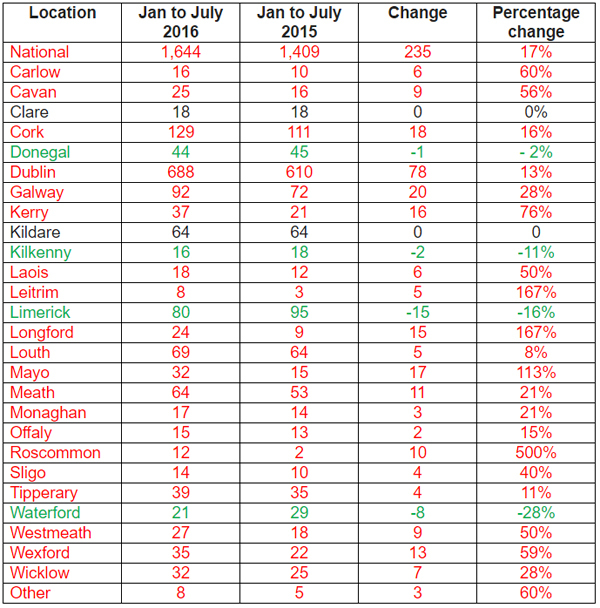 Between January and July, claims increased in 20 counties, with the largest percentage change being in Roscommon, which recorded an increase of 500% as the number of claims rose from 2 to 12. A decline in four counties. Four counties experienced a decline in the number of claims, the largest drop being in Limerick which had 80 claims, down from 95 in 2015. MIBI, which was established by the Government and the insurance industry in the 1950s, pays out approximately €60 million a year on claims involving uninsured or untraced drivers. David Fitzgerald, the body’s chief executive, warned that the jump in claims involving such drivers would likely impact on premiums in the future. “An increase of 17% represents a significant jump in the number of claims being lodged. It showcases the increased pipeline of payments facing the MIBI. While no sums are yet attached to these claims, unfortunately more claims generally means higher levels of payments coming from the MIBI and ultimately, that will impact on motor insurance premiums,” he said. Hiqa inspectors found that some staff felt they were being troublemakers if they raised concerns about the quality of disability services. Major patient safety concerns have been raised in a series of critical reports into HSE-run disability services around the country. 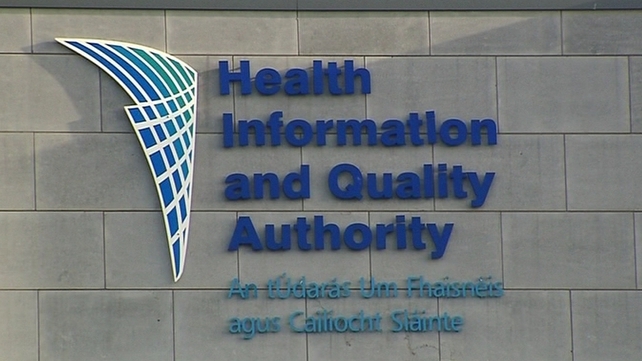 Inspectors from the Health Information and Quality Authority (Hiqa) noted incidents of peer-to-peer abuse, misadministration of medications and failures to adequately report complaints of alleged mistreatment following visits to a number of large disability centres in Cork, Kilkenny and Donegal. During an unannounced visit to the St Raphael’s Campus in Youghal, Co Cork, it was found that a resident had not been given adequate food and nutrition for a period of more than 18 hours. Those working at the centre said there were not enough members of staff on duty on that particular day to get the resident out of bed and feed them appropriately. The Youghal campus, which had court-applied restrictive conditions placed on its registration last year due to previous negative findings by Hiqa, also came in for criticism for incorrect use of seizure and antimicrobial medicines which could have “potentially catastrophic” or even fatal impacts on patients. The facility is currently in the middle of a winding-down process and is due to close next year, but inspectors recorded an ongoing “lack of clarity for staff around the reporting of allegations of abuse”. One resident alone had made 15 complaints of physical abuse by one of his peers over the space of less than a month, but none of these incidents were properly investigated, inspectors said. Serious failings in governance and management were identified at an unnamed disability service in Donegal during another unannounced inspection in March. Despite initially being told by the person in charge that there had been no “incidents, suspicions, allegations or investigations of abuse” there since 2013, Hiqa officials later found that such allegations had indeed been made and investigations were instigated. Inspectors said the person in charge subsequently handed over documents relating to the alleged incidents of abuse, and they concluded that “there was a significant risk to the safety of residents as a consequence of seriously inadequate safeguarding arrangements in the centre”. Speaking to inspectors, some members of staff felt they were being seen as “troublemakers” if they highlighted problems with safeguarding measures or instances of possible mistreatment. Elsewhere, Hiqa was not satisfied that the requisite improvements had been made to service provision at St Patrick’s Centre in Kilkenny which was taken over by the HSE in October 2015 following “significant failings” by the previous care provider. Incidents of peer-to-peer aggression had continued since the handover, and there were still “significant concerns regarding the lack of suitable governance and management arrangements to oversee the quality and safety of care provided to residents” which had “direct negative outcomes for residents”. A smaller community-based facility for six residents in Westmeath failed to demonstrate compliance for any of the nine standards tested during a visit in March, and the two-story house had no overall evacuation plan in the event of a fire. It was also found to be deficient as regards safeguarding measures, as the member of staff designated to deal with complaints told inspectors they were “not aware that they had been assigned this responsibility” and said they did not have time to carry out managerial roles alongside their frontline duties. The findings came in a raft of 11 inspection reports released by Hiqa on Monday. Other centres visited managed to demonstrate more consistent compliance with regulations, and there was evidence of a good quality of life for residents within these services. The State’s health watchdog also provided an update on two autism care centres which are operated by Gheel Autism Services on behalf of the HSE after it took over control from the Irish Autism Society following negative inspection outcomes published in July. Inspectors found that significant improvements had been made in safety and quality of life of residents at both premises. Big jump in car sales accounts for the overall boost? The volume of retail sales increased by 12.6% in July when compared with June and there was an increase of 6.3% in the annual figure. If car sales are excluded, there was a decrease of 0.5% in the volume of retail sales in July when compared with June and there was an increase of 2.7% in the annual figure. The sectors with the largest month on month volume increases were motors which were up 12.5%, furniture and lighting, up 5.3%, and books, newspapers and stationery, up 2%. 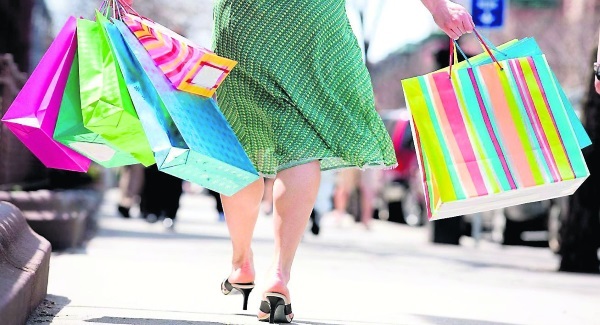 The sectors with the largest monthly decreases were clothing, footwear and textiles which were down 2.5 per cent. Other retail sales are down 2.4% and food, beverages and tobacco are down 0.9%. There was an increase of 4.5% in the value of retail sales in July when compared with June and there was an annual increase of 3.9% when compared with July 2015. But hype springs eternal. 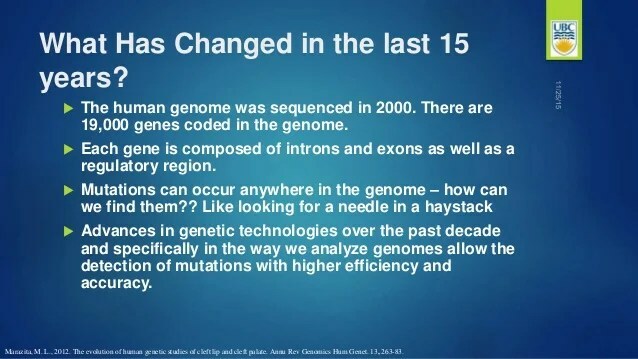 The human genome is now old news; today scientists study tens or even hundreds of thousands of human genomes. We now hear promises about the imminent benefits of personalized medicine, medicine that is tailored to an individual’s unique genetic make-up. President Barack Obama hopes that “10 years from now we can look back and say we have revolutionized medicine,” from cancer to Alzheimer’s. To achieve this, the White House has launched another large research effort: the Precision Medicine Initiative, which will devote hundreds of millions of dollars to advance the use of genomics and other cutting-edge science in medical practice. It’s an admirably ambitious vision, but in 10 years we shouldn’t expect to look back and see a revolution. Scientifically, this is the right direction — over the long-term, genomic discoveries will certainly drive major medical advances. But it’s going to be a long slog. 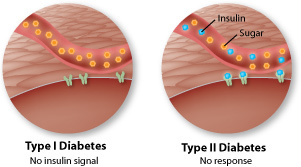 The major challenges that lie ahead are laid bare in a recent genetic study of Type 2 diabetes. This study, published inNature earlier this month, shows that the genetics of diabetes is a mess — and it illustrates why the big promises of genetic medicine won’t be realized any time soon. The hypothesis behind this approach is that diabetes is a bit like Leo Tolstoy’sfamous claim about unhappy families: Each case of diabetes is affected by genetics in its own way. In other words, although diabetes is a common disease, its genetic component might not be caused by a set of relatively common mutations. 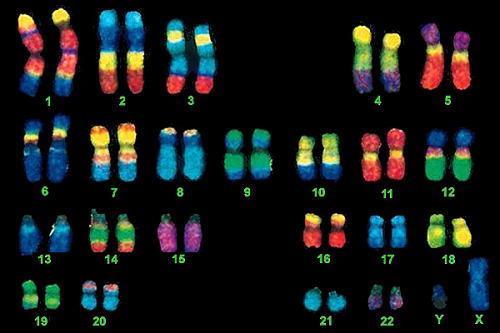 Rather, each person’s genetic risk could be the result of distinctly different, and relatively rare, mutations. Bacteria is apparently rife there? Bartender asks would you like a lemon slice with your cold alcoholic beverage? Your reply “That sounds bloody marvellous” – stick it right in. Thanks kind sir for supplying me with alcohol and a lovely bit of citrus fruit that perfectly compliments my beverage. There’s nothing wrong with that Friday night (tad overly enthusiastic) exchange right? Wrong. 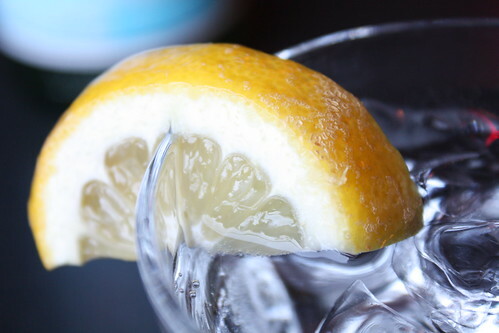 According to a study published in the Journal of Environmental Health the lemons and limes given out at bars are actually rife with all kinds of bacteria. That’s just not what you want. Plus we just found out that water bottles can be pretty rank too. Can someone just cut us some slack. 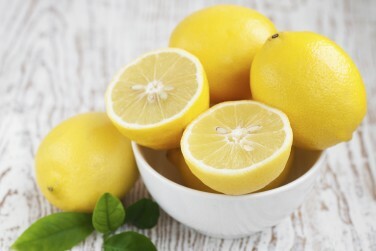 The research team swabbed lemon slices that were on their drinks at 21 different restaurants, and they discovered that almost 70% of the samples had some sort of microbial growth, including 25 different microbial species. Ewwwww. But also I wonder if they got to expense all those drinks. Not a bad life despite the germs. Wow – way to ruin the humble lemon guys. Elle magazine spoke to Philip Tierno, PhD, a clinical professor of microbiology and pathology at New York University School of Medicine and author of The Secret Life of Germs who explained why they can be so gross. But here at Cosmopolitan we deal with solutions, not problems. What you’re gonna need to do is eyeball your bartender as he prepares your drink, and then send it back if you see the bartender put their fingers all over the rim of the glass or use a dirty rag to clean the glass. Thanks for the tips Tierno. 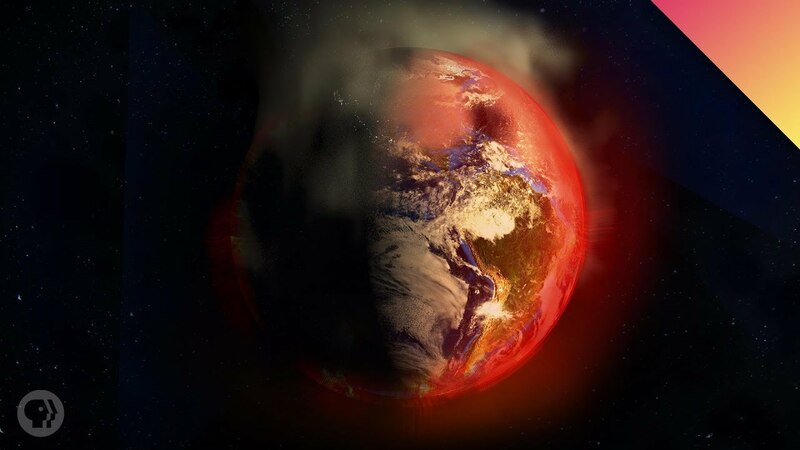 Researchers from the University of Tokyo have uncovered a rarely detected type of seismic wave deep inside of the Earth stemming from a “weather bomb,” an extratropical storm that is small, fast-developing and possesses central pressure that rapidly increases in intensity. The findings could help scientists map out the hidden, deeper structure of the Earth. Despite their rapidly intensifying central pressure – typically more than one millibar per hour for the course of 24 hours – weather bombs are fairly small storms. However, their fast-moving nature creates steep pressure gradients, leading to the formation of strong winds. In the current study, the weather bomb occurred between Greenland and Iceland in 2014, creating a pressure pulse that spread to the seafloor and transformed into microseismic waves – tremors deep inside of the Earth that stem from natural phenomena – that rippled through both the surface and interior of the Earth. Microseismic waves are detectable as both surface and body waves. Although it is typically not possible for surface waves to be observed past the coast, body waves make their way deep into the Earth’s interior and can be detected by land-based seismic stations, making them ideal for deconstructing the internal structure of the Earth. Body waves can be split into two categories: P-waves and S-waves. P-waves contain particles that move parallel to the direction of the waves’ motion, whereas the particles in S-waves move perpendicular to the direction of the waves’ motion. While seismologists frequently detect P-waves, the detection of S-waves by seismic stations is not a common occurrence. Hi-net arrays work by taking the information gathered by seismometers that pick up the “noise” created by microseismic waves as they move through the various layers of the Earth and transforming it into electronic data that can be charted and analyzed in the lab. The successful detection of rare S-waves provides seismologists with a novel method of uncovering the Earth’s deeper structure. S-waves are of particular use due to the fact that they are more sensitive to liquids than other waveforms, meaning scientists can use them to determine areas of the Earth’s interior where solids turn into liquids.